In mid-1970s San Francisco, a modest little cosmetic revolution was born. It was called “mineral makeup”. Fast forward a few decades and mineral makeup has burst onto the cosmetics market – the latest addition to an emerging beauty culture seemingly dedicated to healthier living. Everyone is getting in on the trend. Brands who had quietly been making mineral cosmetics for decades now find themselves in competition with some of the most famous cosmetic brands in the world. So what is mineral makeup all about? A mineral is a solid inorganic substance found naturally occurring in the earth. Coal, kaolin, diamond, pumice, talc and zinc are just a few of the commonly known minerals from a list of several thousand. Minerals have a definite chemical composition, crystalline structure and are inert, meaning that they cannot sustain any life. Minerals are removed from the earth by mining. After being mined, the raw minerals are separated from the other mined materials (like ores), purified and crushed into fine powders to form microscopic crystals which can then be used in cosmetics. Some have to undergo various processes to produce the required compound used as an ingredient e.g. the mineral zinc is vapourised to combine with oxygen to create zinc oxide. The term “mineral makeup” applies to a type of face makeup, including foundation, eye shadow, blusher and bronzer that is made with dry, loose mineral powders. Other makeup items such as lipstick, cream and liquid foundation, lip gloss, pressed powder items and pencils are also often called mineral makeup if they have a mineral ingredient element to their composition. However, these items need the addition of other ingredients which the dry loose mineral products do not contain. For the purposes of this article, we are talking about the original loose powder products. 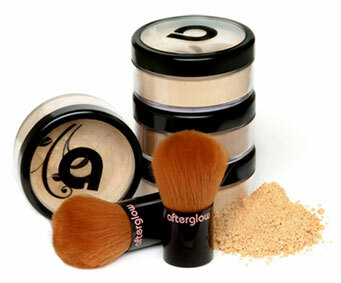 Mineral makeup in its purest form is a fine loose powder comprised only of minerals ingredients. These minerals are combined to produce a range of foundation colours along with eye shadows and blushers. The minerals are not combined with oils, waxes or any of the other ingredients often found in cosmetics like synthetic fragrance, preservatives, mineral oil, binders and synthetic colours. The texture of minerals is just as important in mineral makeup, creating the light and airy feel of a mineral makeup. Finely-milled mineral crystals overlap each other on the skin, forming a filter that allows the skin to breathe and function normally while helping to protect it from airborne pollutants and sun damage. Loose mineral products come in a sifter pot and are applied with a foundation brush, usually a Kabuki or a flat-topped brush. Minerals and mineral compounds have been used in cosmetics for thousands of years, including some which we wouldn’t use nowadays like lead! Titanium oxide and zinc oxide are mineral compounds that provide natural sunscreen properties, are matte and give coverage. Iron oxides can bered, green, brown or yellow, which mix to form a variety of colours and all the skin tones from light to dark. Mica is a lightweight mineral with reflective and refractive qualities, which create shimmer and add shine to the product’s finish. While minerals do occur naturally in the earth, many cosmetic-grade mineral ingredients are produced synthetically or, for those that are actually mined from the earth, undergo lots of processing to create the ingredient and purity required. Made from just a few ingredients such as titanium dioxide, zinc oxide, iron oxide and mica. These mineral makeups are free of all other ingredients including preservatives, artificial colours, synthetic fragrances and bismuth oxychloride, though some may use botanical extracts in their formulations. Made from just a few ingredients plus bismuth oxychloride. It is the inclusion of the ingredient bismuth oxycholoride that causes much controversy.It is used by some manufacturers who still label its products as “pure” or “natural” – and the purists are not impressed. More about this in a bit. Made from minerals and other ingredients. Brands that add additional ingredients to their formulas, making their mineral products not really that much different to their standard products. These products are fairly easy to weed out by checking the ingredients listed on the label. As mineral makeup has become popular, the canny marketing departments are quick to get on board and label anything with a hint of mineral as “mineral makeup”! Google “bismuth oxychloride” and you’ll get mountains of articles about this ingredient! It has become a controversial ingredient when used in mineral makeup as many people feel it can trigger skin irritation, causing it to break out in a rash or itch uncontrollably. If you have used mineral makeup and had a bad reaction, check the ingredients and if bismuth oxychloride (or bismuth chloride oxide) is in there, it’s possibly the culprit of your skin’s irritation. Bismuth oxychloride is commonly used in a wide range of cosmetics. It is an inorganic chemical compound that is used as a filler, a white pigment and to create a pearl-like silvery sheen (“pearlescence”) in makeup. Some companies use it because it gives the skin a magnificent glow and some use it because of its bulking properties. It can be found naturally in the rare mineral bismoclit, though the majority of bismuth oxychloride is manufactured by combining bismuth (a by-product of mining and processing metals like lead and copper) with chloride. It is also this “man-made” process that some people find objectionable, as it contradicts their “pure ethos” view of mineral makeup. If you have damaged or sensitive skin, or simply like to stick to trusted ingredients as much as possible, it may be best to avoid using mineral makeup products that contain bismuth oxychloride. Mineral safety data sheet for bismuth oxychloride. Microscopic particles help to give the ultra-smooth coverage of mineral makeup – one of the factors that makes it so popular. However, another controversial aspect of some mineral makeups is the size of the particles achieved through the manufacturing process. Some brands use ingredients that are processed so finely that nanoparticles are created. Nanotechnology is the science of manipulating matter at an atomic and molecular level. Yes – tiny! It is a relatively new science and it raises the same issues as any new technology, including safety, toxicity and environmental impact. Some researchers believe that reducing the molecule size to the level of a nanoparticle can impact on how that substance behaves. Minerals like zinc and titanium are safe when applied to healthy skin, but in micronized nanoparticle form there remains a concern, particularly when applied to damaged skin or when inhaled. Much research has yet to be carried out on nanoparticle use in cosmetics and calls for tighter regulation of nanotechnology have risen, along with the growing debate about its safety and the need for clear labelling on products that use them. Is Mineral Makeup for Everyone? Like all cosmetic products, mineral makeup has its fans and its critics. Fans love the easy-to-apply, natural-looking and long-lasting glow, and people with sensitive skin like the fact they can use makeup without fear of an allergic reaction. Critics, on the other hand, find minerals drying, irritating, accentuates wrinkles and that the colours have an ashy undertone – a particular problem for darker skin tones. In theory, mineral makeup is suitable for everyone: all ages, skin tones and skin types. Of course, everyone’s skin is unique and minerals work better for some people than others. It may work better for people with normal to slightly oily skins, rather than those with dry or really oily skin. Also, as each brand uses different combinations of ingredients, some will work better on darker skin tones than others. Ultimately, it is all about trying different brands to see what works. Most makeup brands have free or cheap samples available, and makeovers at retail outlets allow you to try a product for free to see if it meets your requirements. Cosmetic companies are great at marketing and using clever word trickery to woo us into buying their products. Ignoring all the “jingo lingo”, what can mineral makeup do for us and our skin? Virtually no risk of allergy or irritation: Even a good quality natural cosmetic doesn’t carry a 100% guarantee, but the likelihood of a reaction is less likely than products with a long list of ingredients. The most irritating ingredients in standard cosmetics like fragrance and preservatives aren’t found in pure mineral makeup. Watch out for the ingredient bismuth oxychloride which may cause skin irritation for some people. Doesn’t grow nasty bugs: As minerals are inert materials, they cannot support any life including bacteria, hence there is no need for preservatives. However, brushes used to apply the minerals can still harbour bacteria, so clean your brushes properly, and if you use the lid of your product to decant the minerals, then keep it clean too. Long shelf life: Loose minerals last a long time and don’t go off like traditional liquid and cream formulations. Cream and liquid mineral products contain ingredients like water, wax and oil which will eventually go off. Anti-inflammatory properties: Zinc oxide has anti-inflammatory properties and can have a calming effect on the skin. Some dermatologists believe that mineral cosmetics are a better option for those recovering from chemical peels, laser treatments and cosmetic surgery. Reading various dermatology-related forums on the internet, some people with rosacea and acne have had positive experiences with pure mineral makeup, especially the ones without bismuth oxychloride. It provides some UV protection: Titanium dioxide and zinc oxide are used in many regular sunscreens to provide natural broad–spectrum protection against UVA and UVB radiation. This means that while these minerals do naturally offer some sun protection, the actual level of protection is not guaranteed without a SPF rating. Also it is about application. Sunscreen advice says “apply liberally” and makeup is not generally applied liberally, nor is it usually applied to other exposed areas of your skin. If you want to guarantee protection for your skin against UV radiation, use a sunscreen and then do your makeup. It feels light and looks natural: For some, liquid or cream foundations feel too heavy and mask-like. Mineral makeup has a light texture and, even when applied to give more coverage, a natural look can be achieved. Again, this is personal and some people find minerals too powdery and drying. Ease of use: You only need a small amount of product and it goes on quickly and blends easily with a bit of buffing. However, it can also be messy! All those loose powders can get free from the pot if you’re not careful. Tip: when you first get your new mineral pot, don’t rip off the clear plastic cover over the sifter holes. Just pierce a few holes, enough to get product out, but keeps the flood at bay! Sheer to fuller coverage: Go sheer or build up to a fuller coverage if that’s what you want. It can also be used as a concealer. Build layers one by one to create a fuller coverage; don’t go in heavy handed! Staying power: Minerals last really well, rarely needing a touch-up during the day. The powders are water resistant and they won’t crease or smear easily. Minerals last well in all weather conditions too, less chance of them sliding off your face in the heat! Virtually every cosmetic company is jumping on the mineral makeup bandwagon and there are lots of products now formulated around minerals. Mineral cosmetics now come in a variety of formulations, from the original loose powders to the more recent pressed powder, liquid and cream formulations. Of course, going back to clever marketing, some companies will slap “mineral” on products to gear us into thinking that is is somehow better for our skin than regular makeup! The companies below provide a wide range of mineral makeup products and none of them test on animals (a few are even BUAV certified). We’ve listed them as we’ve used various items from all of them and they’ve worked for us. But, it is the same old case of “buyer beware”! If you want to avoid certain ingredients, read the ingredients list as some brands may use bismuth oxychloride, carmine and other things you might not want. And if you can, try a sample or a free makeover in a store before you spend. A Guide to Foundation: formulations and tips for picking the right product. Cruelty-Free Cosmetics: how to find cosmetic products that aren’t tested on our fluffy friends. I never like it when girls seem to have makeup caked on. I like that you mentioned that mineral products have a more natural and light look to them. I feel like that is the look women should be going for.